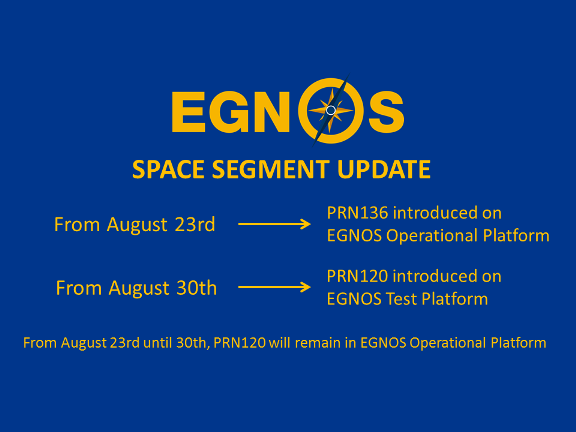 Please note that GEO120 will be kept on operational mode for one more week (until 30/08/2018 at 13:00 UTC) to ease the transition to the new configuration. We encourage EGNOS Users to configure the GEO Satellites described on the table above accordingly in order to retrieve the optimal solution. Nevertheless, you can contact the EGNOS Helpdesk at egnos-helpdesk@essp-sas.eu, submitting an EGNOS Helpdesk form or calling at +34 911 236 555. Moreover, the active GEO satellites are shown on the “EGNOS System Availability” Section on the homepage of the EGNOS User Support Website, as it provides real-time information on this matter. You can find further information on the GEO swap on Service Notice #15. Should you like to manage your subscriptions on the EGNOS Documentation Notification Service, including the Service Notices, please refer to the “subscriptions” tool that will allow you to select the notifications you would like to receive.